Cooks have a lot of latitude for creativity with salmon, because its rich texture and firm flesh make it suitable for almost any preparation. Often that means grilling or searing the portions, but simpler cooking methods such as steaming are more respectful of the salmon's own flavor and succulence. 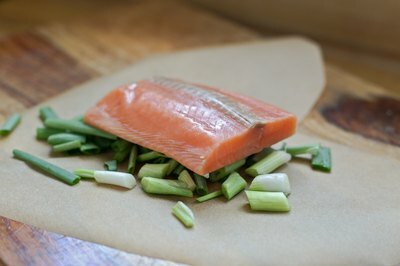 Your can likely choose among several options for steaming salmon, depending on the end result you need and the equipment you have at hand in your kitchen. Place a steamer insert into a stock pot, Dutch oven, saucepan or deep skillet. 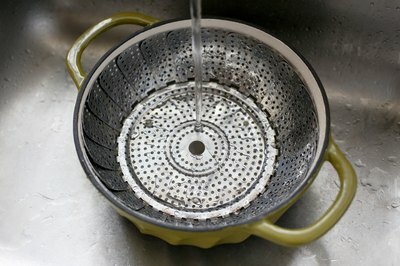 If you don't have a steamer insert, use a round wire trivet or cooling rack instead. Raise it above the water's surface by resting it atop heatproof ramekins, or balls of crumpled-up aluminum foil. Add an inch of water or other liquid to the bottom of the pan, ensuring that the steamer is raised at least 1/2 inch above the waterline. Cover the pot and bring the water to a vigorous boil. While the water is heating, season the salmon portions with salt and pepper or any other flavorings you wish. 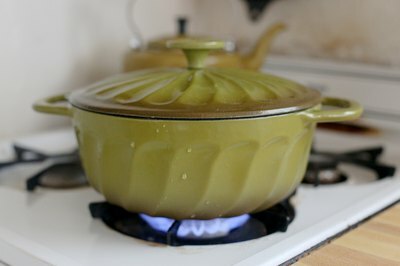 Open the pot, taking care to keep your hands and face well away from the initial gust of steam that will escape. Using long tongs, place the portions in the steamer. Arrange them so the steam can circulate freely between them. 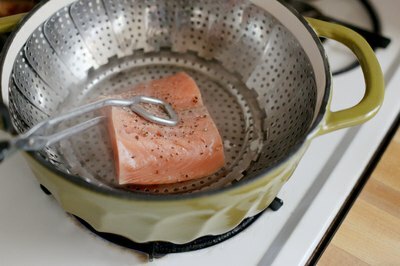 Replace the lid, and steam the salmon for 4 to 8 minutes. Thin portions from the tail end of the fillet will cook more quickly, while steaks and thick portions from the salmon's midsection will require a longer time. 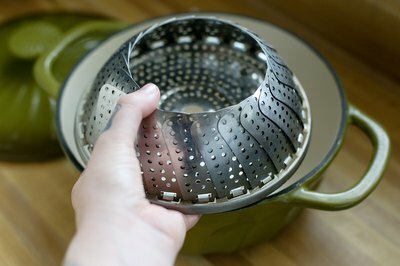 Remove your steamer from the heat, and carefully lift the lid. 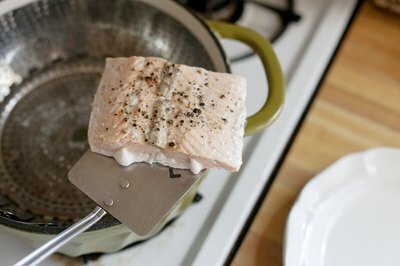 When the steam has dissipated, lift the cooked salmon carefully from your steamer with a spatula or slotted spoon. 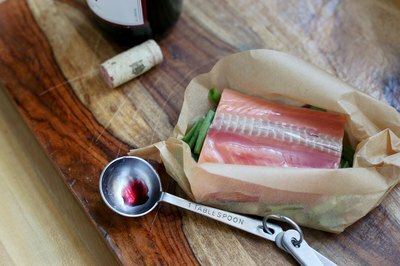 Serve hot, or cool and then refrigerate the salmon for cold dishes. Lightly oil the interior of a bamboo steamer. Place it in your wok, making a note of where the steamer's base meets the sides of the cooking vessel. 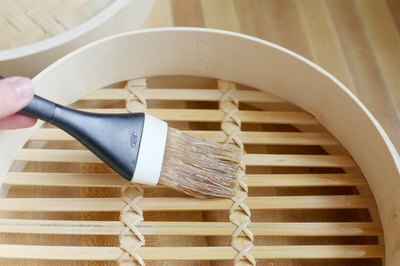 Lift out your steamer, and fill the wok with water to within an inch or so of the point where the steamer's edges rested. Turn on the heat beneath your wok, and bring the water to a boil. 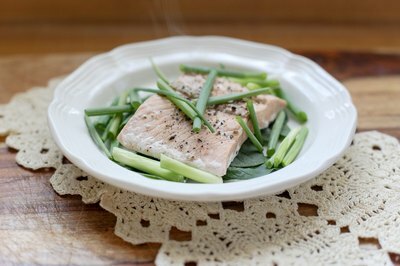 Season your salmon with toasted sesame oil, soy sauce or similar flavorings to taste. 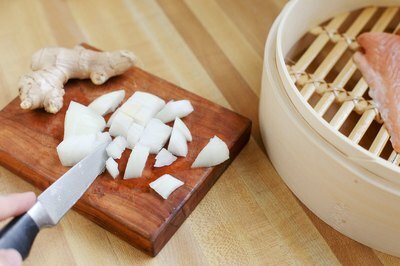 Slice or shred aromatic vegetables such as spring onions, ginger or daikon, and mound them loosely in your steamer. Nestle the salmon portions into these aromatics, and place the lid on your steamer. 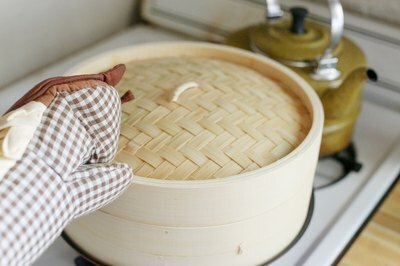 Return the steamer to your now-boiling wok, using oven mitts or towels to protect your hands from the steam. Steam the salmon for 4 to 8 minutes, until it's on the verge of losing its pink translucence at the thickest part of each portion. Remove the portions from the steamer gently, using a spatula or slotted spoon, and serve warm or cold with the vegetables and other suitable side dishes. 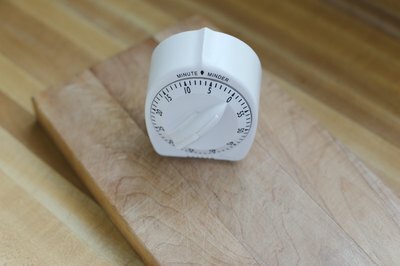 Position an oven rack in the top third of your oven's space; close the door and preheat to 400 degrees Fahrenheit. Cut out a heart-shaped piece of parchment paper, approximately 12 to 15 inches across at its widest point. 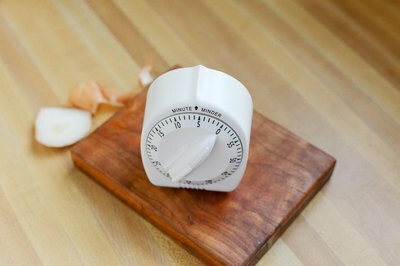 Open it up and build a small mound of spring onions, fresh herbs or other aromatic ingredients. Place a portion of salmon on top. Repeat for each remaining portion. Season the salmon portions with salt and pepper, chopped herbs, spices or other flavorings as you wish. Add a tablespoon of wine, cider, fruit juice or other flavorful liquid, as desired, to create additional steam. Lift the edges of the parchment and line them up, and then fold and crease them to make a seal. Start at the rounded top of the heart, finishing at the pointed bottom. 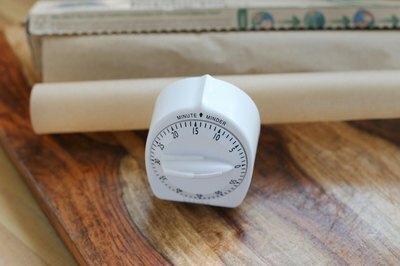 Give the point a twist, to ensure a good seal, and then transfer each parcel to a foil-lined baking sheet. Tuck the end of the pouch under. Bake the parcels for 12 to 15 minutes, until they're brown and puffy. Remove them from the oven, and serve immediately. Your portions can be removed from their parcels, or else plated in their wrappers and opened at the table for a showier presentation.